Today is the launch of a fun new online magazine, Splendidly Homemade. It’s a lifestyle magazine filled with food, entertaining, home décor and craft ideas. I was honored to be asked to be a contributor to the premiere issue. The winter issue features delicious holiday foods, creative decorating and gift ideas, as well as my Perfect Pie Crust Tutorial and Farmers’ Market Tomato and Zucchini Quiche recipe. Splendidly Homemade is free online. 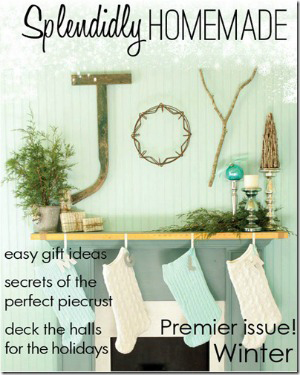 The editors of Splendidly Homemade are the talented Liz from Hoosier Homemade and Gina from The Shabby Creek Cottage. I hope you’ll take a few minutes to check it out. 1. Blueberry Apple Mini Pies. I love berry pies and adding apples gives the filling more volume and a nicer texture. Mini pies are such a fun trend. You get a whole pie all to yourself! 2. Vanilla Bean Cheesecake. A rich vanilla bean cheesecake baked in a graham cracker crust, layered with white chocolate mousse and topped with chocolate shavings. Served with a fresh strawberry coulis. 3. Fresh Strawberry Pie. My daughter’s favorite pie. Instead of using junket, you use crushed strawberries in the filing, which gives it a stronger strawberry flavor. 4. Lemon and Berry Swirl Mini Cheesecakes. I love serving mini cheesecakes. Everyone gets their own little cheesecake, it’s easy to serve, and by baking a fruit swirl into the cheesecake, it’s already decorated and ready to eat. 5. Apple Cranberry Streusel Pie. My favorite pie for Thanksgiving. It’s a perfect combination of sweet and tart. A flaky pie crust is topped with a tart cranberry layer, followed by cinnamon apple layer, topped with a sweet crumbly streusel topping. My idea of a perfect pie. 6. Coconut Cream Pie with a Chocolate Crumb Crust. My daughter described this pie as amazing. It’s a rich, creamy pie version an Almond Joy. So tell me about you. 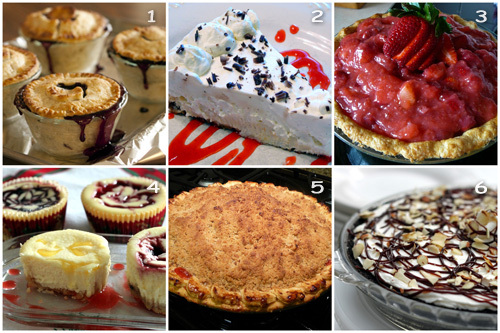 What’s your favorite pie? Feel free to leave me a link. Congratulations, Barbara! They could not have chosen a better person or pie for their premiere issue! I can feel it..this is the start of the soon to come ‘Barbara Bakes’ cookbook! I actually bet my BF, when I showed him some of your amazing cooked and baked goods, that it would happen soon 🙂 Congrats to all the other lovely pie bakers too! Thank you everyone for all the sweet comments! I really have the best followers/readers/commenters/blog friends! Congratulations! I will absolutely check it out – I would even pay for a subscription if it came in the mail. 🙂 My favorite pie is a Dutch Apple Pie (with the crumb topping)… but I don’t have a recipe for it. Any chance you do, or know someone who might? Looking to get one on the table for Thanksgiving. Look forward to reading the online magazine!! Thanks Kim! I don’t have a Dutch Apple Pie recipe, although I read that Cook’s Illustrated has a good one. So many pies, so little time! They all look super, well done on being featured in the magazine too. JUST GORGEOUS! Yay GF…so thrilled for you. Congrats!! That first issue looks splendid in every way! That first savoury tart is calling my name. We share ‘pie love’. What a fun magazine! I’m excited to check it out! I also can’t wait to try baking another pie with your amazing crust. 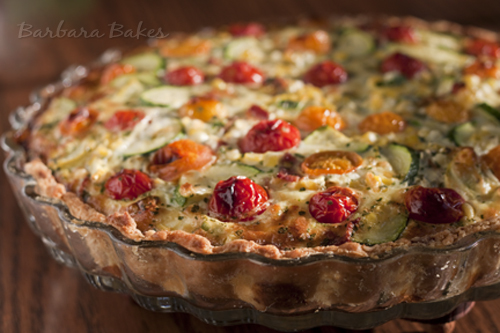 I still can’t get over how amazing the zucchini tomato quiche tasted!! I’ll definitely be making it again! Congratulations! You deserve it and much more! Congratulations on being asked to be a contributor for Splendidly Homemade! 🙂 How exciting! that’s so awesome, way to go! everything sounds so wonderful. OH MY GOODNESS!! Congratulations!! You are pretty much my hero!! Congratulations Barbara that’s very exciting! I had my first ever pumpkin pie on the weekend and I have to say it’s pretty up there with the best pies ever. Wow this is spectacular looking I just have to try this one! congratulations, it all looks so good!